Australian gamers now have reason to wipe the Mountain Dew from the bum-fluff on their chins and smile. After years of campaigning, the Australian government has finally said ‘yes’ to an R18+ classification category for video games. This means the games that were previously deemed a little too mature for a ‘mature’ rating can be sold to adults rather than banned outright. It’s the official, legally-recognition of video game’s growth into adulthood. Finally, the lawmakers can see video games no longer a toy… but a fully-fledged form of media. Great! Right? Well yes, but it’s prompted me to realise something. Something that would make the gawky 12-year-old version of me shake his bowl-cut head in devastated betrayal. Games are just not fun anymore. Fun is frivolous, carefree and enjoyable. It’s frolicking around sprinklers on a hot day, sliding around linoleum in socks… almost breaking a rotator-cuff trying to bounce a bouncy-ball into orbit… that’s fun. Repeatedly witnessing your gory, simulated death in every twisted, horrific and physically-realistic way imaginable… that’s a little different. So, immersed we are. Immersed in worlds that do their best to deceive our senses with realism, blockbuster spectacle and ultra micro-management. 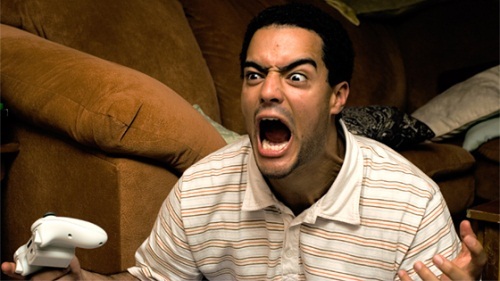 It’s Call of Duty here, Skyrim there… video games today are so damned complicated. They’re not the pastime of yesteryear you could nonchalantly pick up and enjoy, no – they’re binding commitments that seize huge tracts of your already-scarce attention span and ‘immerse’ you in a world of stress and emotional bombardment. 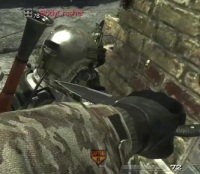 Nothing more fun than getting knifed in the ear! Boot up Modern Warfare 3 for some happy online gun-slinging and in no way does the word ‘fun’ come close to describing your first encounter. You’re thrust into a chaotic warzone armed with an impotent spud gun and no idea what to do. The dozen other player are all 14 years old and armed to the teeth with weaponry devised by Satan and a vocabulary that would make Gordon Ramsay cry into his couscous fritters. And no matter what, they’ll kill you. They’ll shoot and stab and kill you some more before you even figure out what button you press to cower in a bunker and sob. It’s ruthless, frustrating and downright demoralising. Worst of all, because your ‘noob’-ness is on display for all to see thanks to the levelling-system, you attract every single bullet, rocket, grenade, throwing knife and goddamned apache airstrike on the battlefield. Oh and every blunt, spiteful insult…you WILL be the victim of brutal verbal hate crimes, of that there is no doubt. ‘Fun’ doesn’t really materialise until you’ve endured several dozen hours of being repeatedly murdered – and frustrated to the point you’ve almost smashed your controller through your own face. That’s MW3 – the game that took just 16 days to rake in $1 billion revenue. Then there’s Skyrim. A game that, unfortunately, has addicted me with unrelenting force… get it? Probably not, because the only people who might get that are chained to their Skyrim slave-master, promising themselves for the 37th time they’ll go outside ‘after just one more quest… just one…’ That or they’re dead; in a dank study littered with Pringles crumbs and half-finished bottles of Pepsi – their pallid corpses lit up by the flickering load screen of the vampire-filled Cronvangr Cave. Grim. But again, it’s hard to really describe the game as ‘fun’. Skyrim is impressive, it’s interesting, it’s engaging – sensationally immersive for sure… but is ‘fun’ the word you use to describe the experience where you spend most of your time trekking about, stealing cabbages from barrels? How about endless conversations with characters who sound like a cross between Arnold Schwarzenegger and the Swedish chef from the Muppets? It depends on how much you love cabbage and puppets. It can be too overwhelming. 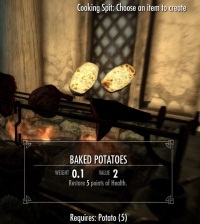 Virtual baked potatoes? My favourite! The old days – it’s always the old days – were simpler. I do miss those days when video games were two-dimensions – pixels and beeps, but we played them anyway. The decent downloadable offerings are few and far between, and even handheld gaming is getting lost in technological mad science. Perhaps I’m drunk on nostalgia, but nothing surpasses the modest charm of those 8 or 16-bit console games that I grew up with. You had three buttons: run, jump and punch. That’s how you got by. In everything. There was no stealth mode, no micro-managing, no morality-meters and no agonising over the customisable length of your character’s goatee hair… just baddies to jump on and lava to jump over. Run, jump, punch. It takes about six buttons and two cracked metacarpals to run in a video game today. Or worse, you actually have to run and jump yourself. I suppose that’s an ironically verbose way of saying that simplicity is an underrated quality these days. We wrongfully assume ‘simple’ means ‘primitive’, or’ inferior’. But not everything thing has to shatter the boundaries of what we think is possible. Sometimes simplicity is the more efficient gratification, It demands little, but can yield the same pleasure as something far more complex. It doesn’t matter if you reach your goal by jumping across colourful platforms, or by single-handedly taking down battalions of enemy soldiers from the back of a burning helicopter… if you win, you win. Do we really have to work so hard for a little fun? It’s time I holstered my Akimbo P90 SMGs and blew the dust off my old Sega Megadrive.